IT was a case of 'The King is dead, long live the King' at the Bet Butler Stadium as a favourite player left and a talented youngster returned. After four great seasons as a Dumbarton player, striker Bryan Prunty made an emotional farewell to the club and fans as he left to join Airdrie United. Meanwhile 19 year-old Chris Kane of St Johnstone returned for a second loan spell at the Rock — and scored the winner against Livingston. Sons started the match with no points and badly needed a win or at least a draw. But the home crowd saw an uninspiring first half in which the visitors largely dominated, though Colin Nish and Mitch Megginson came close to breaking the deadlock. After the break manager Ian Murray sent on Kane to replace toothache victim Nish, and both the game and his team's fortunes were transformed. Kane, who scored ten goals in 18 games in his Spring loan spell, brought pace and the direct approach to the Sons attacking, and three times he came within inches of scoring. Megginson also had a good strike saved. 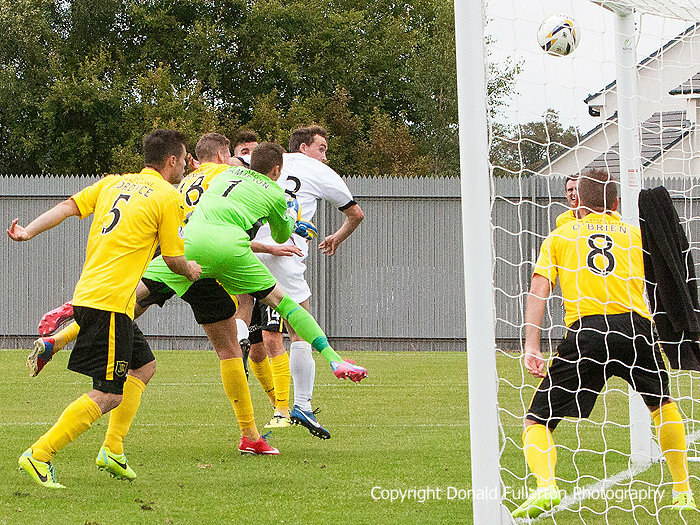 With two minutes remaining the winner arrived, when Kane rose highest to head home a Scott Agnew corner (pictured) . . . and the celebrations began. The three points took Sons off bottom spot in the SPFL Championship, two ahead of Cowdenbeath.